The Basement Advisory Centre expects around 50 Service users through the doors over the Christmas period, most of whom will be rough sleeping or in temporary hostel accommodation. There are so many everyday items and toiletries that we take for granted – toothbrushes, toothpaste, shower gel and deodorant, clean underwear and a warm coat. Imagine how you would feel without these essential items. After the success of The Rucksack appeal last year we are pleased to be a collection point once again. Requests on social media sites have been issued asking for rucksacks to be filled with sleeping bags, flasks, food, toiletries and clothing which will be dropped off at The Basement on 20/12/14 and distributed to those in need over the Christmas period. We would like to thank Paul and the gang from Circo who regularly come in with lots of coats, clothes and toiletries as well as responding to our call outs on social media for items that we are in need of. Imagine if trust have sent us invitations for our service users to celebrate Christmas day with them based at Frontline church. They are hosting a 3 course meal, gifts, games and prizes with transportation if needed. 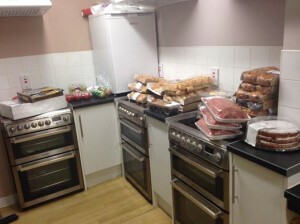 Furthermore we will be receiving our weekly food donation from Steve and the gang at Oasis which always goes down well in our rough sleepers drop in. Without your help and support our work here would be near impossible. There are too many of you to name but you mean the world to us and the clients we support. The difference your generosity makes to people’s lives is hard to describe, but easy to see. So to all our fund raisers, donors and supporters, the clients and staff at The Basement wish you a wonderful Christmas and a very prosperous and happy New Year. ← NCS raise £630 for The Basement! NCS raise £630 for The Basement!